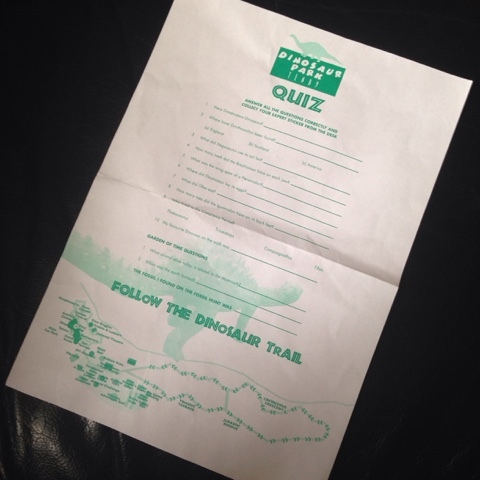 We were also handed a quiz sheet, we didn't get a chance to do this as we didn't go round the longer dinosaur trail due to T's little legs! 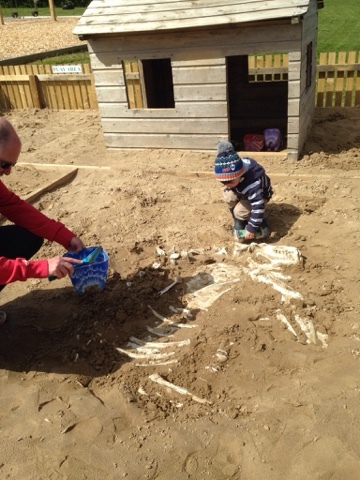 We made our way to the Dino Dig area first, T loved being in there using the brushes and spades to reveal the dinosaur bones. 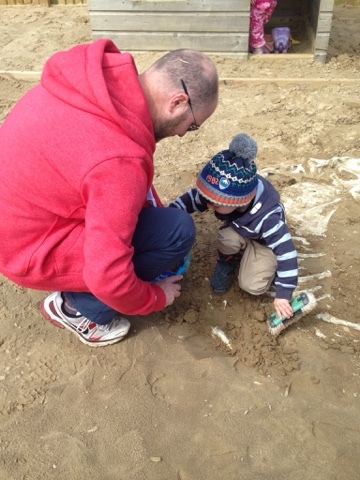 We spent time making sandcastles too with the provided beach and digging equipment, such a lovely idea for budding young palaeontologists. I think that Daddy had lots of fun too! 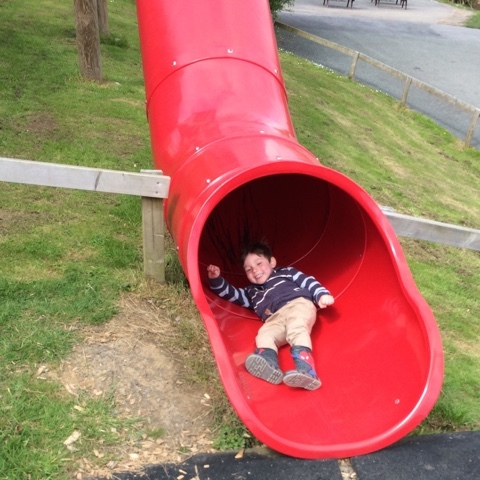 Before moving on to the rides, we had a little play on in the outdoor play area which was all very new and clean and in great condition. 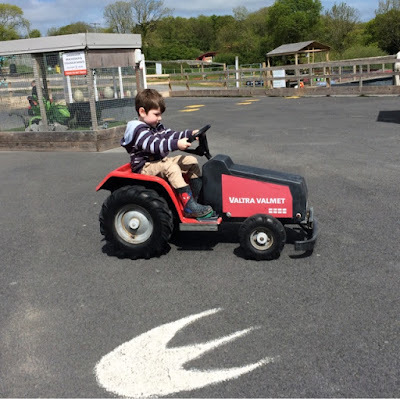 T had a wonderful time whizzing around on the mini tractors, which at 2p a ride are amazing value. 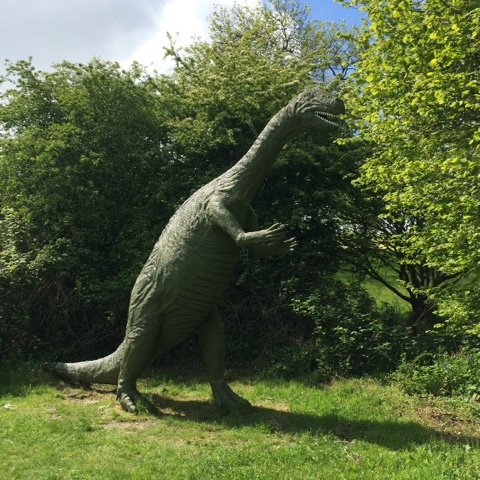 The dinosaurs are all very well kept with clear and detailed information boards. There are 2 walks through beautiful bluebell woods, we chose the smaller one and we didn't think T would make it round the 1 mile longer trail. 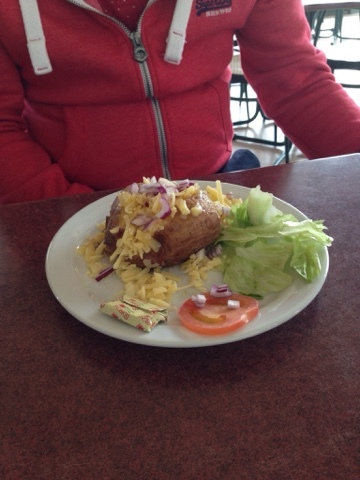 Once we'd been round the woods, we stopped at the café for our lunch, both The Hubs and I had a jacket potato and T had a child's ham roll meal. 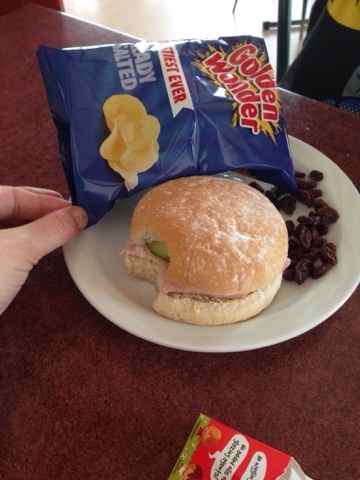 Lunch was very reasonably priced, service was very quick and the café was very clean and tidy. There's a small play area for smaller children in the café which I think is a great idea. 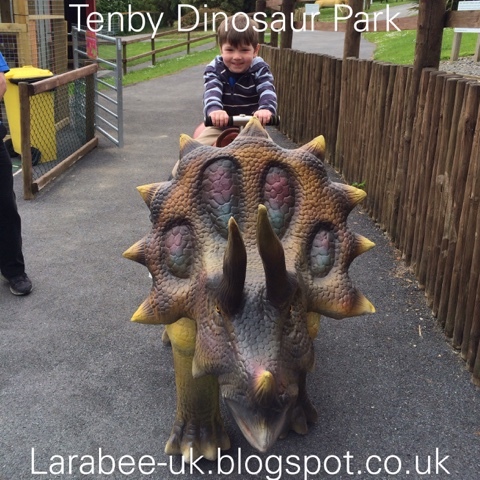 T took a ride on 'Ting Ting' the dinosaur, which was great and £1 per ride. 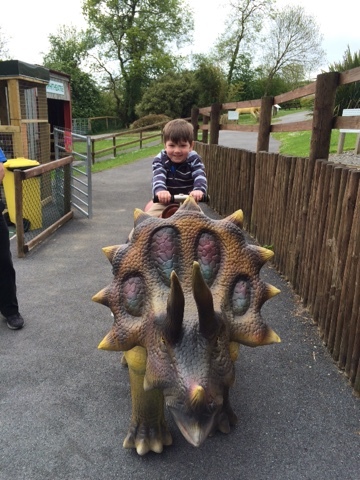 This was such a lovely new and unique experience for him - how many children can said they have ridden a triceratops? Another new attraction this year is a dinosaur safari on a golf buggy, I'm afraid I don't have any photo's, but this was really great. 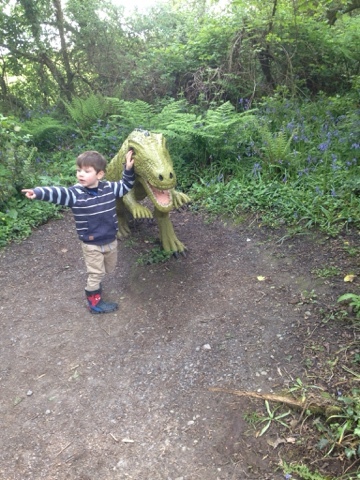 A friendly gentleman took us round 'a secret' part of the wood where the 'new dinosaurs' were kept. 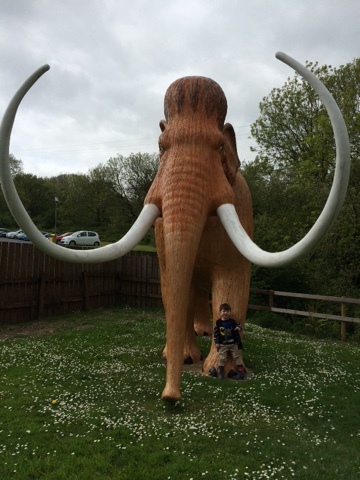 He gave us a talk about the dinosaurs, and warned us that they were hungry and might eat the man on the back of the golf buggy! T liked this a lot! 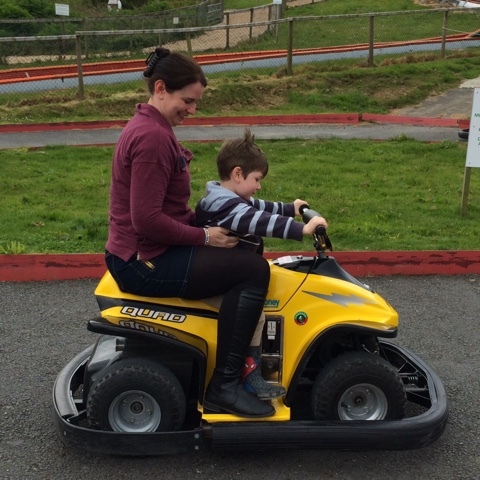 After our safari, we headed down to the 2p quad bikes, T and I had a few goes round the track, we had a lovely time, and again, fantastic value. 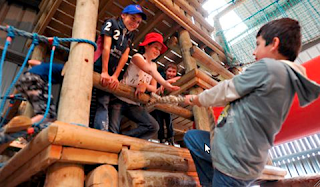 We finished our visit with some time in the indoor play den, there aren't many photo's as both The Hubs and I were up on the play equipment with T! Prices are £9.95 for adults and £9.25 for children and OAPs there's also an amazing offer on season tickets too, full pricing details can be found here. We thought that value for money The Dinosaur Park is fantastic, we will certainly visit if we ever stay in Pembrokeshire again. 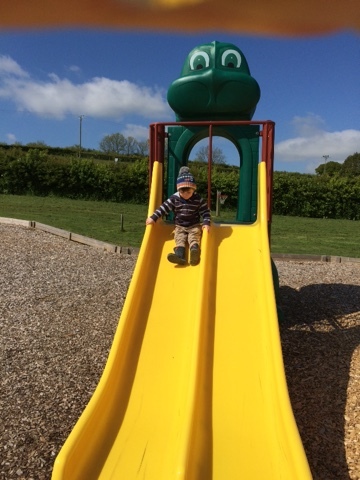 I only wish that it was nearer as T and I would get a season ticket, for the indoor and outdoor play areas alone. And really? Where can you get a ride on a tractor or quad for 2p - amazing! We enjoyed lots of goes and would have stayed longer if we didn't have another commitment in the early evening. We had a wonderful day and highly recommend a visit. Disclaimer: we were kindly given free entrance in return for an honest review.